Reliable assessment of cardiac function is an important tool for diagnosis and prognosis of multiple cardiac and extracardiac diseases. Echocardiography and MRI are the most commonly used methods to evaluate cardiac function, but can be limited or contraindicated in certain patients. 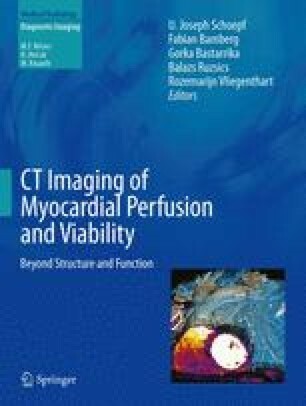 Functional evaluation with CT may play an important role in these patients and in those patients being evaluated for coronary artery disease. Functional imaging requires a retrospectively gated acquisition and special attention must be paid to the contrast injection technique for appropriate analysis. Left and right ventricular analysis is evaluated both quantitatively and qualitatively. Quantitative measurements with CT have shown close correlation with values obtained with CMR. Acute and chronic infarcts and non-ischemic cardiomyopathies can have a characteristic appearance on imaging. Functional and volumetric measurements of the left atrium can be carried out with similar technique for evaluation of patients with mitral disease or atrial fibrillation.